I was really done for the night, but then I got an invite from Tai Feng to come play with his guys. He had four guys ready to play a draft pick normal. I had turned him down in the past, and really wanted to have a fun game with these guys, so I went for it. After I joined their party I asked if they had any voice communication methods like Skype, Ventrilo, or TeamSpeak. They confirmed that they had Vent. When I joined their channel they were quick to throw down the humorous: “Welcome to our humble Adobe!” I thought that was pretty fun, and very friendly, so it put me right into the mood to win some games. Tai suggested that I play mid when we were in Champion Select, so I obliged. I’d be more than happy to play mid, it’s what I do! Looking at their team comp we were pretty sure it would be Kennen mid and Malphite top. Boy did they pull the switcheroo on us! I had a terrible time mid vs Malphite. At first I was bullying him around because I have unlimited mana and could hit him with blue cards whenever he tried to throw his shard at me. However, his jungler was adamant about killing me. Luckily, I knew that the damage Malphite would be pumping out would have diminishing returns, and if the mummy didn’t build some ability power he would be in the same boat and they would lose late without an AD carry. Time to gank bot. Ganking bot actually turned out to be a terrible idea. I had a number of times where I would show up in bot lane, teleporting down there with my ultimate, only to be CC locked by Alistar and followed up by a Varus ult. The Adobe bot lane would say, “aw, nice try” and then they would see me Flash under turret, land a gold card on Varus, and finish him off with Wild Cards. I would have made it out, but I thought Taric needed my help, so I stepped out only to realize I was out of mana, had cancelled my recall, and now Kennen had found me. Boo. We were slightly behind in this game because Malphite was staying pretty even in mid (let’s be real, it’s Malphite in a short lane, his ultimate carries him back to turret, that wuss), Kennen was doing really well in top lane, and bot was only slightly ahead. We needed to make some magic happen to win this game. I decided it would be best to split push. I shoved out bottom lane while my team grouped mid. When the enemy team tried to transition down to stop me from pushing my team followed up with immense pressure and actually caught some of the enemy team out of position. We were making our comeback! We had a team fight in bot lane after one of those transitions where we aced the enemy team and didn’t lose a single member of our team. Eventually we were pressuring top lane and Adobe managed to gift me a triple kill to save my KD. The enemy team would throw their ults down, we would survive through them and then have more sustained damage to help us win the fights. 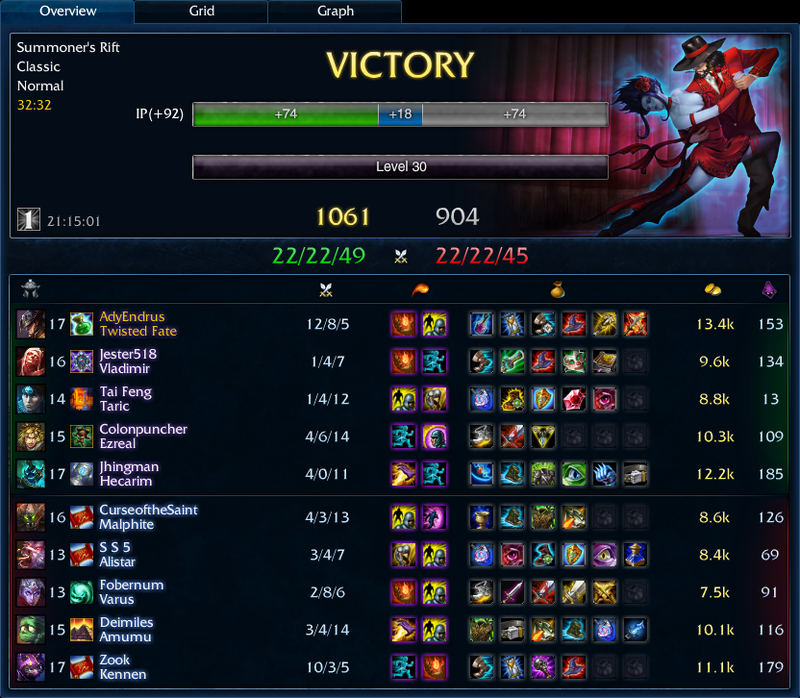 I’m still having too much fun with Twisted Fate. I love his mobility. I may make the switch to Boots of Mobility, but I’m not sure if it would be worth it to sacrifice my spell penetration especially where I’m running movement speed quints. Maybe I’ll try it out for a game or two, but I don’t think I could put the extra movement to good use where my ultimate can already teleport me out. Maybe Boots of Swiftness? We’ll see. GG Adobe!